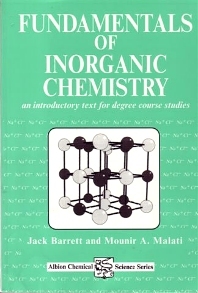 This work is a foundation course text for first and second year undergraduates in which description and understanding of inorganic chemistry are fully integrated. It covers the main underlying theoretical ideas, taking account of the level of mathematical ability among present-day students commencing university study. Each chapter provides "worked example" problems, supported by additional problem-exercises which test comprehension and serve for revision or self-study. Introduction; Nuclear and radiochemistry; Electronic configurations of atoms; Molecular symmetry and group theory; Covalent bonding in diatomic molecules; Polyatomic molecules and metals; Ions in solids and solutions; Chemistry of hydrogen and the s block metals; Chemistry of the p block elements; Co-ordination complexes; Chemistry of the d and f block metals; Appendix; Further reading; Solutions and index. Jack Barrett Imperial College, UK. Mounir A. Malati Mid-Kent College of Higher/Further Education, UK.